The ghost of the hanging chad returns: Florida’s hard-fought U.S. Senate race, which had focused extensively on education, appears to be headed to a recount as of mid-day Wednesday. Republican Rick Scott, currently the state’s governor, is leading sitting Democratic Sen. Bill Nelson by about 30,000 votes, which is which is 0.38 percent of votes cast, according to state records. Florida law triggers an automatic recount if the margin of victory is under 0.5 percent. Scott’s campaign said the race is over and the call for a recount is “a sad way for Bill Nelson to end his career,” Politico reported. 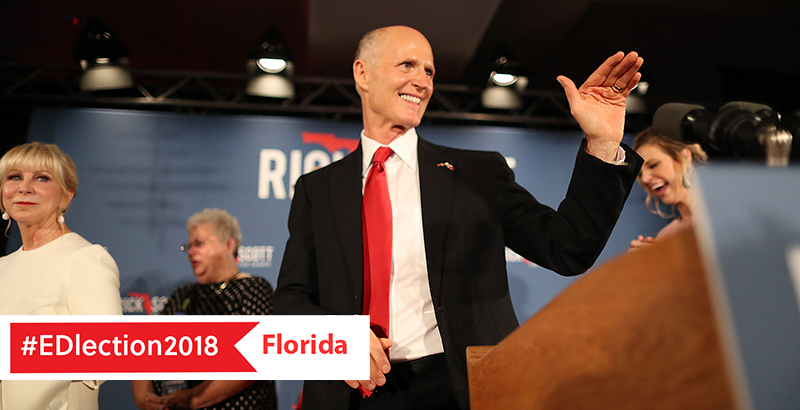 Republicans have already cleared a hurdle to maintain their majority in the Senate, but flipping a seat red in a pivotal electoral state like Florida carries special significance. The race had focused extensively on education, including spending, national rankings of the state’s schools, and school safety and gun control after the Parkland shooting earlier this year. In September, Scott ran an ad touting what he said were Florida’s “first-in-the-nation” test scores in 4th and 8th grade, AP classes, and “college education” plus highest-ever spending on schools. Nelson quickly followed with his own ad, charging that Scott had cut over $1 billion from public schools, leading to a ranking of 40th among the states, and a shortage of teachers. In reality, according to the fact checkers at the Orlando Sun-Sentinel, neither was totally correct, with Scott fudging Florida’s No. 1 spot in terms of growth on the National Assessment of Educational Progress tests for overall proficiency, and AP class enrollment instead of a better benchmark — the number of students who passed AP exams with a high enough grade to earn college credit. On spending, there was a substantial cut under Scott’s watch, most of which happened during the Great Recession, but it’s largely been restored. And while per-pupil funding is at its highest ever, it’s still far below the national average. The two also sparred during an October debate about gun control and school safety, with Nelson saying Scott was too closely aligned to the NRA, and Scott saying Nelson hadn’t done enough on gun control during his nearly 18 yearsin the Senate.